We know well that coming back to work or school may not be too pleasant after the holiday, and at this time of the year, motivating ourselves might seem to be also harder. At the end of the workday, do you just sit down in front of the TV? Let us say that it is not the best idea. Take part in interesting programs instead of it! If you can spend your free time well, you may work more effective the next day! We can recommend you some valuable programs for the evenings or at the weekends in September in Budapest. Although summer is the period of festivals, the overture of the autumn also offers interesting cultural, sport, or gastronomy events. You can find several kinds of sightseeing tours or other trips, and if you prefer something really unique, book a cruise on the River Danube! Adoring the sunset on the waves of the second biggest river in Europe will be an unforgettable memory for everyone especially because the real heat is gone and the air is refreshing on board. Do you love sport and animals, too? If do, Budapest National Gallop is the best choice for you! It is an interesting equestrian which is organized on the Heros’ Square. In most years, this event is held in September. Children usually love horses, which are huge and noble animals, so they also can enjoy this program. This event is quite spectacular: not only because of horses but also due to the beautiful hussar-costumes which the riders wear. Hussars were members of the light cavalry during the Hungarian history who abandoned using shields but wore a stylish, colorful dress uniform. For those people who prefer doing sport instead of watching it, we recommend the International Budapest Half Maraton. This event attracts thousands of runners to the Hungarian capital city from year to year. If you do not like the crowd and you are really longing for only some relaxing, choose our sunset cruise on the waves of the capital city’s river. This 75 minutes on the border of daylight and night has some magic feeling. People who are interested in this beautiful natural phenomenon, usually do not try to watch it from big cities. However, on the waves of the River Danube, you’ll have the illusion of nature. Water reflects the sunset’s million shades which makes the experience more mystic. Moreover, you can also admire the view of the representative historical buildings of Budapest on the bank of the river if you enjoy sunset time with us. You need the exact details about the Budapest sunset time, please find them in the list below, or visit our blog for sunset times in other months. Wine Festival is a must-have program. Obviously, you can taste and buy good quality wines, but the program is not only about drinking. You can get interesting information about the culture of Hungarian wines ( for example Tokaji) or take part a wine tour in Buda Castle on the Castle Hill. This location is a World Heritage site. Chocolate and Candy Festival sounds promising, too. This event lasts three days and it is the best for those who are sweet-toothed. You can try unique foreigner and Hungarian desserts during an exclusive chocolate tasting tour while your children can spend their time in several kinds of workshops. Besides the regular concerts in the St Stephen Basilica or the Mathias Chuch, there are two music festivals which are real delicacies. They are the Ujbuda Jazz Festival and the Baroque Music Festival. Unfortunately, this latter one is not held in every year, but in most years we can enjoy the brilliant music of Bach, Purcell, Vivaldi, Pachelbel, or Handel. An enchanting cruise on the River Danube with the lights of sunset around you means an excellent overture of any music event. A tour like this is an excellent family program but you can also surprise your dearest one with it. You, he/she, and the waves sparkling in the sunset… Can you imagine more romantic? Our luxurious motorboats can be rented as well with their professional staff. 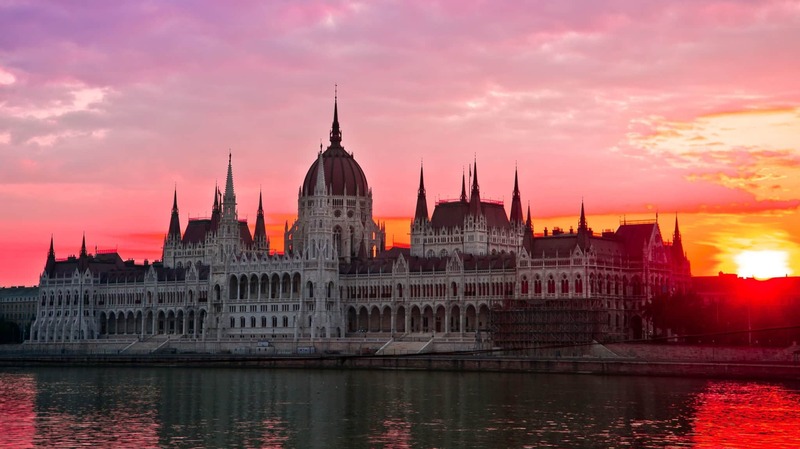 Do not miss the sunset times Budapest in September! Our luxurious ships or boats, our kind and professional staff, and naturally the wonderful view of the Hungarian capital city guarantee that you won’t be upset at the end of the day. Contact us via our website on phone, book a sunset cruise, and enjoy sunset Budapest today.